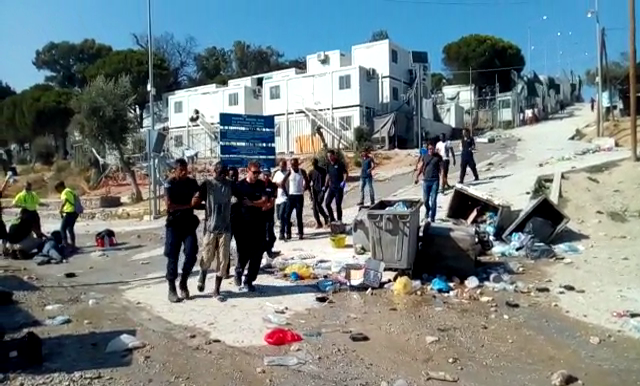 On Tuesday the 18th of July 35 people were arrested in Moria Refugee Camp in Lesvos, Greece, after clashes with riot police using teargas and violence, which followed the peaceful protest refugees held in the morning. Originally published in Greek by Mustaferat. Translated for Enough is Enough by Black Cat. According to the arrestees’ lawyers, immigrants are being transferred to various Greek prisons. We recall that out of the 35 who had been arrested at July 18th (the original text says Saturday 22/06, but the 35 were arrested on July 18th), only 30 people have testified (in the past, it had been incorrectly stated it was 31). Of the remaining five, the four did not testify because an interpreter specialized in their language could not be found and the fifth was a heavily injured Senegalese who had been taken to hospital. The release of the four people, who did not manage to testify since there is no interpreter available, was also ordered due to the expiry of the mandatory detention time, during which their testimonies should have been taken. However, two of those remain in administrative detention since their asylum applications were rejected at second instance and they are soon to be transferred to the Immigrant Detention Centre in Moria. For all four, however, the case remains open and will be taken to the investigator once an interpreter is found. The Senegalese was brought to the investigator today and following his testimony, charges against him were filed. In contrast to all the others, he is no longer in detention but is released with restrictive conditions. Of the 30 who had testified, 19 have been taken to Korydallos and Avlonas and two more in Chios prison. A large number of the persecuted immigrants have filed law suits against the authorities for assault and ill treatment during their arrests and detentions at the Central Police Department on Lesvos. #RefugeesGR: Poster With Information About #FreeTheMoria35 & #PetrouRalli | Enough is Enough!